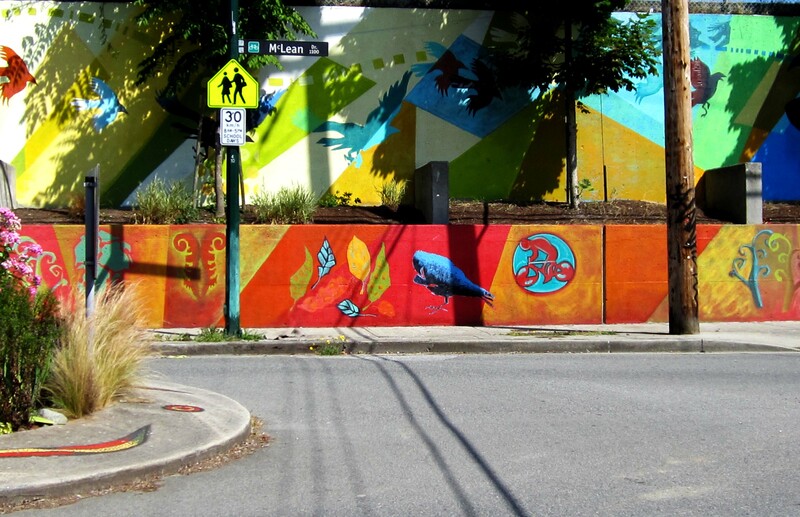 East Vancouver, around the Commercial Dr. area is known as the boho artsy part of town. The neighborhood used to have and still does, a heavy Italian and Chinese influence, mixed with artists, First Nations and lesbians. It’s eclectic, used to be lower income and filled with many restaurants. Every fall there is the East End Culture Crawl where people can wander through the many artist studios in the area. As much as these characteristics are part of the cultural pastiche of East Van, the natural fauna include raccoons and crows. Crows and Ravens are our local board and even the seagulls don’t compare. Every evening as the light leaves the sky, murders of crows fly east to Burnaby and the Grandview cut to roost for the night. 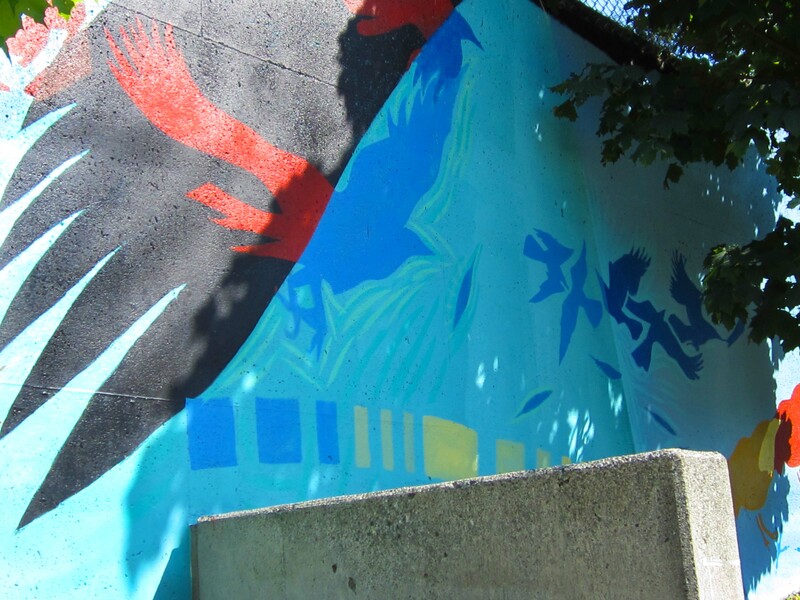 It’s no wonder that recently in a community beautification project, that crows feature largely. Britannia Centre includes a high school, day care, library, park, year-round skating rink, swimming pool, gym, courts and other areas. The school grounds take up several city blocks and on the west side there is a large retaining wall. A few years back, they rebuilt it and people have been trying to do some community gardening there though it’s been sporadic. 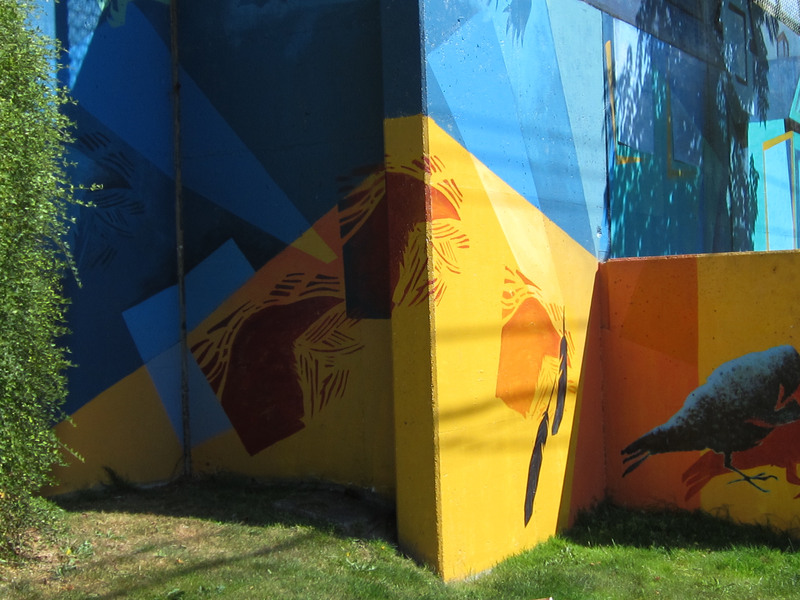 But recently, in the last two months, during Vancouver’s cool weather this year, people were showing up to paint the walls. I was curious. Was it a random flash graffiti mob or was it organized? People came with stencils and I’d say the bottom part was done by participants who didn’t need to be artists. 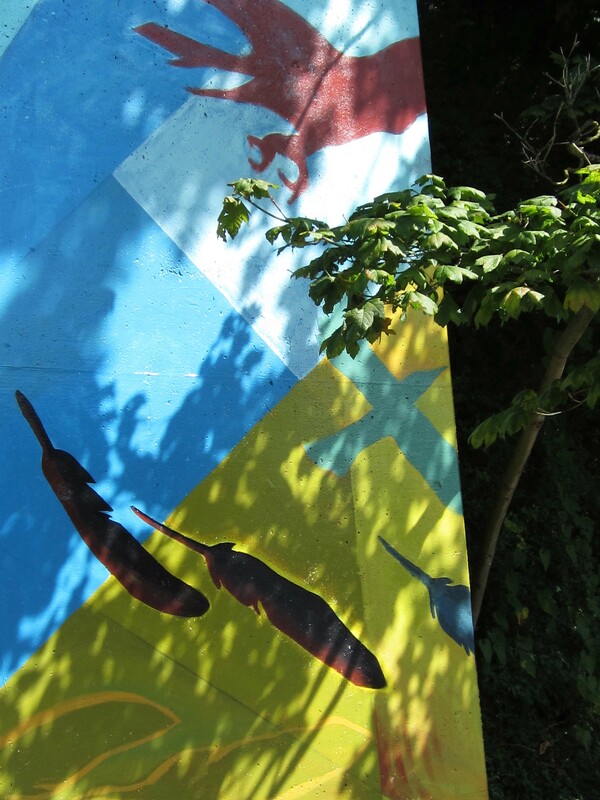 Several people blocked the background geometrical colors, while others came along and blocked in one color with a stencil. 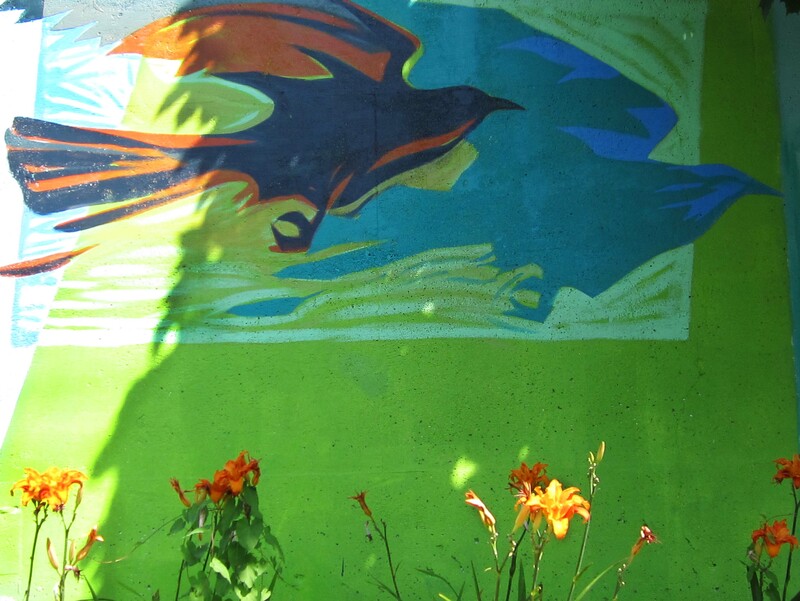 Later, I saw some guys doing the top part of the wall, which is covered with flying crow silhouettes. 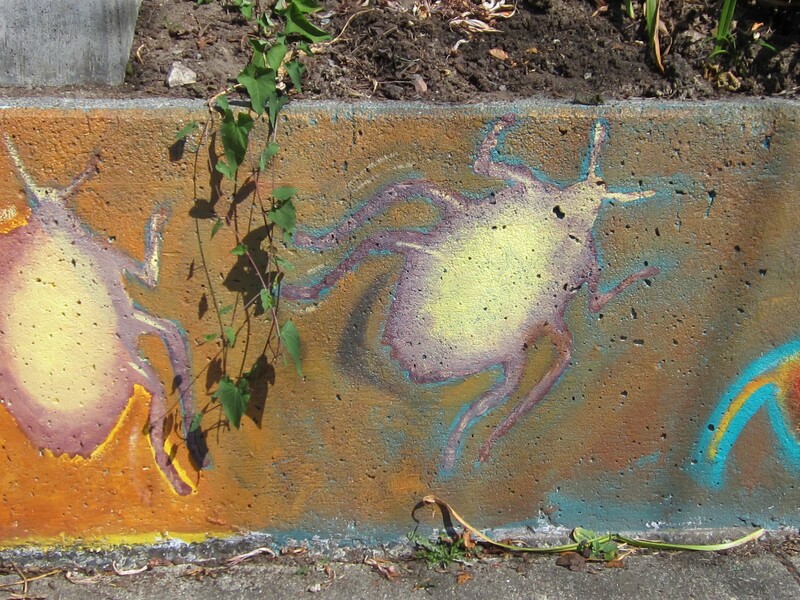 The bottom half has bugs, bicyclists, birds and leaves. What really worked for this wall was the range of colors, bold swatches behind bold designs. All of the images have had depth added to them with brushstrokes of other color. The wall is interesting and complex without being overly busy and it’s so much nicer than the bland concrete of before. I don’t know who paid for this project, if it was the community or the city or some combination but it is a beautification plan that has greatly enhanced the area. The wall is two blocks from where I live and I love walking by it. The only thing that could dampen it, like some of the other walls in other areas, is if people paint graffiti over it. I don’t mind graffiti but it’s disrespectful, pointless and destructive to paint over other art. Here’s to hoping there are more projects to make the city look better, and to community spirit.